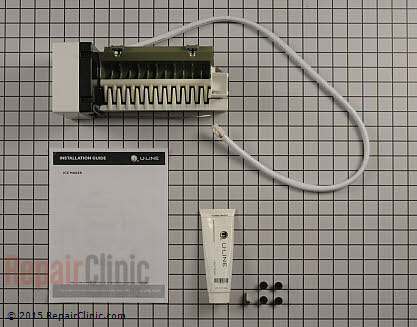 If your U-line ice maker model ULN-B12115 not making ice These can be tricky to repair from time to time. That being said lets see if we can walk thru some of the common problems these may have. The first thing that you always check is if there is water in the Ice Maker Module. If you do not have water lets check our water valve. Remove your water line from the valve and make there is water going to it. 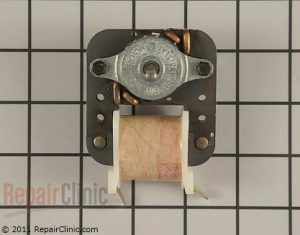 If there is you need to make sure there is 115v going to your valve. We do this by putting your Ice Maker Module into a self test shown below. When the Ice Maker goes thru its self test, at one point it calls for water. You should hear the humming of the water valve. Make sure there is 115v at the water valve. If there is 115v your valve is defective. If not your ice maker assembly is defective. Remove the front plastic square cap that covers the above shown area. Make sure your ice machine is turned on and your water line is installed. 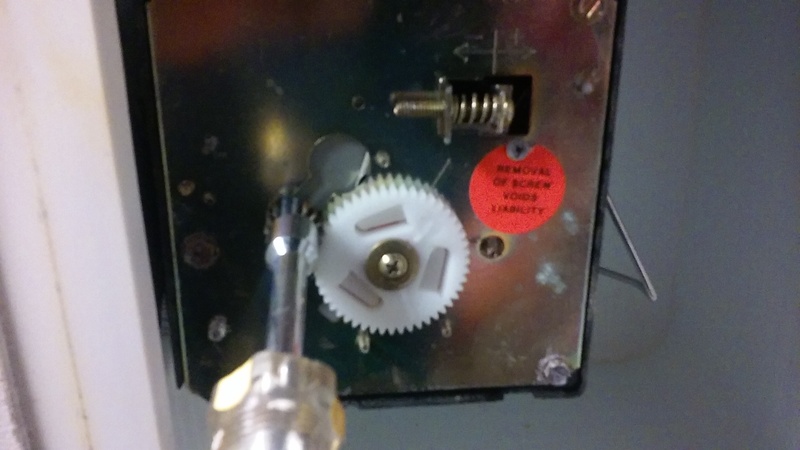 Use a 5/16″ nut driver to slowly turn your drive gear Clock Wise. 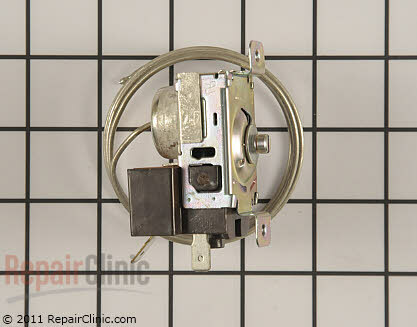 After about a 1/4 turn the ice maker motor will start turning on its own then you can stop and remove the driver. If there is ice in the ice maker already the ice makers gears will go back and forth trying to harvest the ice. This is normal. There is a small heater under the ice tray that warms up to help release the ice. And this some times goes bad. So if the Ice Maker can not harvest the ice your heater is defective. 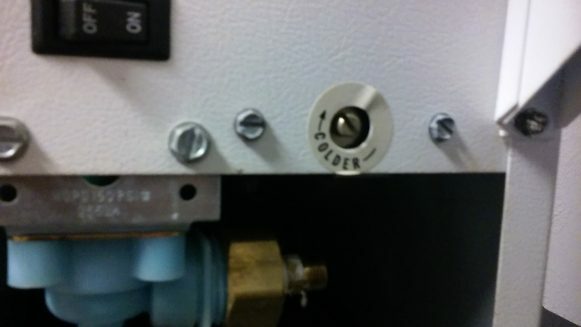 Since the Heater is built in to the Ice Maker Module you have no choice but to replace it. This part comes with instructions on how to replace the assembly. They are pretty good so just follow them. Lets talk about your Temperature Control Thermostat. Located at the bottom front of your Ice Maker. If you know there is electricity going to your Ice Maker and the unit is still dead chances are your Temp Control has failed. Use your meter to check continuity. If it is open, you have a defective control. 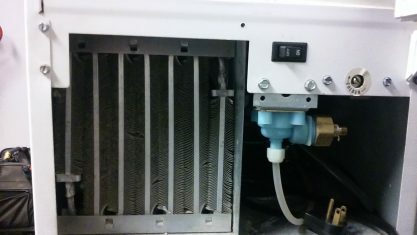 Make Sure Your Condenser Is Clean! Your condenser is behind the front panel this needs to be cleaned at least once a year. Use a vacuum cleaner to remove all dust. This will cause low ice production and miss shaped cubes. It also severely decreases the life of your compressor. Located directly behind the condenser is your Condenser Fan. Make sure you feel the air going thru tour Condenser. If cleaning your condenser and you find that your fan is not working. You gain access to your fan by removing the back cover and there it is. If your compressor is running so should your fan. The run of the same power line. Still have no ice? Then we would look at a sealed system problem. That is another Blog post. If you live in the Dallas or Plano Texas and and your U-line ice maker model ULN-B12115 not making ice give us a call. ← Kenmore refrigerator will not dispense ice.